Umayyad conquest of Hispania (711-718) - After the conquest of the Sāssānid Empire by 651, the Rashidun Caliphate turned west. It had already taken Egypt before the Sāssānids fell, but now wanted to push past the Egyptian border into the North African frontier. But it never got the chance. Shortly after the Sāssānid conquest, there was a civil war within the Arab empire and the Rashidun Caliphate was overthrown in favor of the Umayyad. The new ruling dynasty was no less aggressive or accomplished than the Rashidun had been by the end of the 7th century. It conquered North Africa (Maghreb from the Arabic). And by doing so, brought an entirely new ethnic people into its fold; the Berbers (or Moors). Now with Persia, Egypt and western North Africa under it's control, it really had only one direction in which to go...north. That is, into Europe. It had already tried to go through Anatolia, but the fortified city of Constantinople was impassable. The Straight of Gibralter, however, was wide open. And so in 711, an army of about 10 to 15,000, under the command of Tāriq Ibn Ziyad, crossed the straight and entered Hispania, which was Visigothic land. 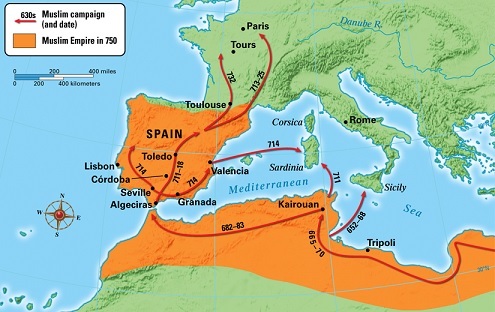 Merchant traffic was common along the straight and the Visigoths were completely unprepared for an invasion, giving the mostly Berber force a distinct advantage. Unfortunately, there is only one source for the Umayyad invasion and it is very incomplete. It is the Mozarabic Chronicle of 754. So we don't really know exactly how the conquest took place. What we do know is that the Muslims won the initial conflict at Guadalete in 712. The Visigoths were lead by their king, Roderic. He was probably killed in the battle for he is not mentioned again after that, and the Visigoths probably were unable to offer much resistance after that defeat. Most of the rest of the Iberian Peninsula fell to the invaders over the next decade; all except for the Northwest corner, which remained in Visigothic hands. This is confirmed by architecture as well as archaeology. The Muslims called their new territory al-Andalus. The Umayyad conquest of Hispania set the stage for two noteworthy historical events. The Battle of Tours, which took place within a few years of the Umayyad arrival in Europe, and the Reconquista (reconquest) by the native Spaniards, over the next eight centuries.